The brilliant star cluster NGC 2100 lies in the Large Magellanic Cloud, a small satellite galaxy of the Milky Way. This image was taken with the EMMI instrument on the ESO New Technology Telescope (NTT) at the La Silla Observatory in Chile. This star cluster lies close to the Tarantula Nebula and some of the colourful outer parts of the nebula appear in this image. 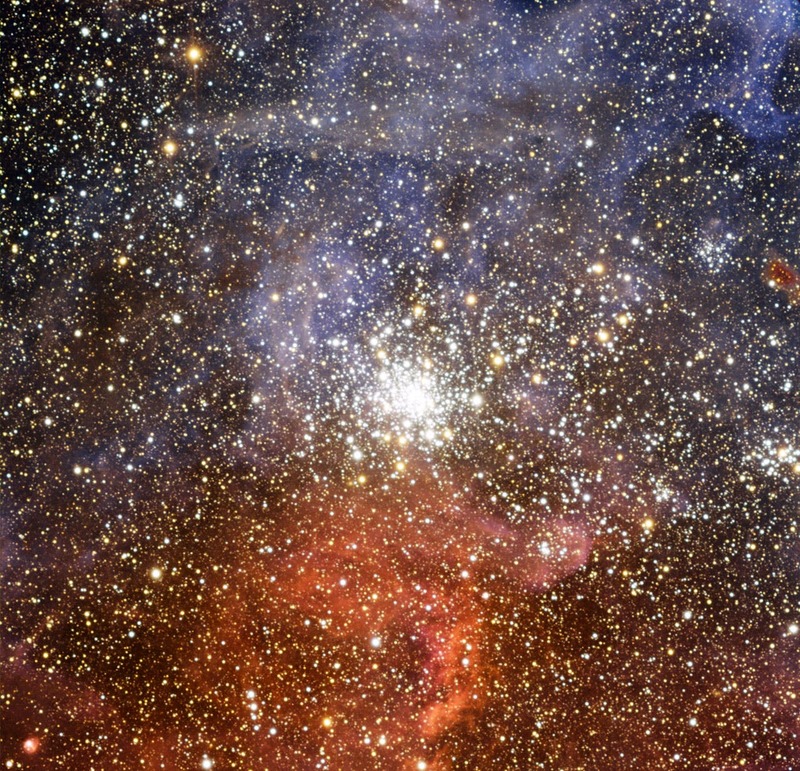 The smaller cluster, close to the right-hand edge of the picture and just below centre, is NGC 2092. The outer edges of the Milky Way also appear to be orbited by innumerable invisible galaxies, one of which appears to be crashing into our own. In 2005 astronomers discovered the first evidence of mysterious dark galaxies with no starlight – VirgoHI 21 – a mysterious cloud of hydrogen in the Virgo Cluster 50 million light-years from the Earth found to be colliding with our galaxy. Virgohi 21 revealed its existence from radio waves from neutral hydrogen coming from a rotating cloud containing enough hydrogen gas to spawn 100 million stars like the sun and fill a small galaxy. The rotation of Virgo HI21 is far too fast to be consistent with the gravity of the detected hydrogen. Rather, it implies the presence of a dark matter halo with tens of billions of solar masses. Given the very small number of stars detected, this implies a mass-to-light ratio of about 500, far greater than that of a normal galaxy (which would be around 50). The large gravity of the dark matter halo in this interpretation explains the perturbed nature of the nearby spiral galaxy NGC 4254 and the bridge of neutral hydrogen extending between the two entities. VirgoHI21 proved to be the first discovery of the dark galaxies anticipated by simulations of dark-matter theories. Although other dark-galaxy candidates have previously been observed, follow-up observations indicated that these were either very faint ordinary galaxies or tidal tails. A dark galaxy is an area in the universe containing a large amount of mass that rotates like a galaxy, but contains no stars, held together by dark matter. Without any stars to give light, it could only be found using radio telescopes. 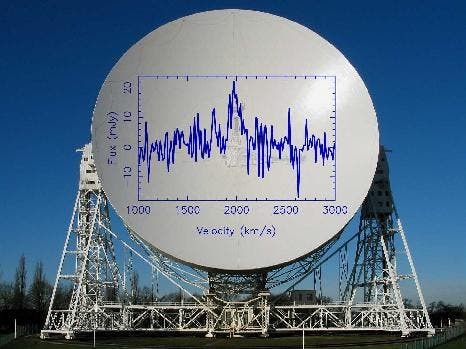 It was first seen with the University of Manchester's Lovell Telescope in Cheshire, and the sighting was confirmed with the Arecibo telescope in Puerto Rico. Astronomers now predict that large spiral galaxies like the Milky Way, have hundreds of satellite galaxies orbiting around them. While a few satellites are visible, like the Magellanic Clouds, many other galaxies are too dim to see. Scientists suspect that these faint satellite galaxies are primarily comprised of mysterious “dark matter,” which makes up 85 percent of all matter in the universe and so far remains undetected. The image below shows contours of HI column density obtained from the ALFALFA observations of the field around VirgoHI21 and NGC 4254 superposed on an optical image. The HI tail extends from NGC 4254 (visible in the lower left) more than 250 kpc to the north (assuming it lies at the Virgo distance of 16.7 Mpc). Using supercomputers at the National Energy Research Scientific Computing Center (NERSC), Sukanya Chakrabarti, developed a mathematical method to uncover these “dark” satellites. When she applied this method to our own Milky Way galaxy, Chakrabarti discovered a faint satellite might be lurking on the opposite side of the galaxy from Earth, approximately 300,000 light-years from the galactic center. “Our approach has broad implications for many fields of physics and astronomy – for the indirect detection of dark matter as well as dark-matter dominated dwarf galaxies, planetary dynamics, and for galaxy evolution dominated by satellite impacts,” said Chakrabarti, assistant professor of physics at Florida Atlantic University. Chakrabarti’s technique involves an analysis of the cold atomic hydrogen gas that comprise the outskirts of a large spiral galaxy’s disk. This cold gas is gravitationally confined to the galactic disk and extends much further out than the visible stars – sometimes up to five times the diameter of the visible spiral. This gas can be mapped by radio telescopes. According to Chakrabarti, the dark satellite galaxies create disturbances in the cold atomic hydrogen gas at the edges of the spiral galaxy’s disk, and these perturbations reveal the mass, distance and location of the satellite. With the help of NERSC systems, she successfully validated her method by analyzing the radio observations of the Whirlpool Galaxy, which has a visible satellite one-third of its size, and NGC 1512, which has a satellite one-hundredth it's size. Her calculations correctly predicted the mass and location of both of the known satellite galaxies. When she applied this analysis to radio observations of our own Milky Way, the analysis revealed a potential dwarf galaxy, or Galaxy X, sitting in the constellation of Norma or Circinus, just west of the galactic center in Sagittarius when viewed from Earth. Because this satellite sits across the Milky Way from Earth, it is obscured in our line of sight by gas and dust, and thus has not been detected. According to her colleague Leo Blitz of the University of California at Berkeley, searching for satellite galaxies with this method is like inferring the size and speed of a ship by looking at its wake. “You see the waves from a lot of boats, but you have to be able to separate out the wake of a medium or small ship from that of an ocean liner,” he says. Simulations of galaxy formation suggest a galaxy the size of the Milky Way should feature about 1000 dwarf galaxies, but only a few dozen have been found so far. Some of the missing dwarfs may be dark galaxies that are all but invisible, he says. Blitz's models predict that the universe should contain far more dwarf galaxies than the tiny fraction that astronomers can identify. If so, Blitz thinks he knows how to find the dark galaxies. "Imagine them plopping through the gas of the outer Milky Way," he says. "They might create some sort of splash or ripple." These distant reaches are relatively calm, making such disturbances possible to detect. Blitz explains, "It's like throwing darts at a board. As these dark galaxies come at the Milky Way, they're likely going to hit the outer parts because there's more surface area there." To pinpoint any dark galaxy hot spots, Blitz and his research group are mapping the structure of the Milky Way. In the process, they have been able to characterize the warping of our generally flat galaxy: "It's like hitting cymbals; it's held in the middle and the outer parts are free to vibrate," he says.Within this structure, Blitz identified areas of very localized vibrations – an encouraging sign – and is now searching other galaxies for similar characteristics. 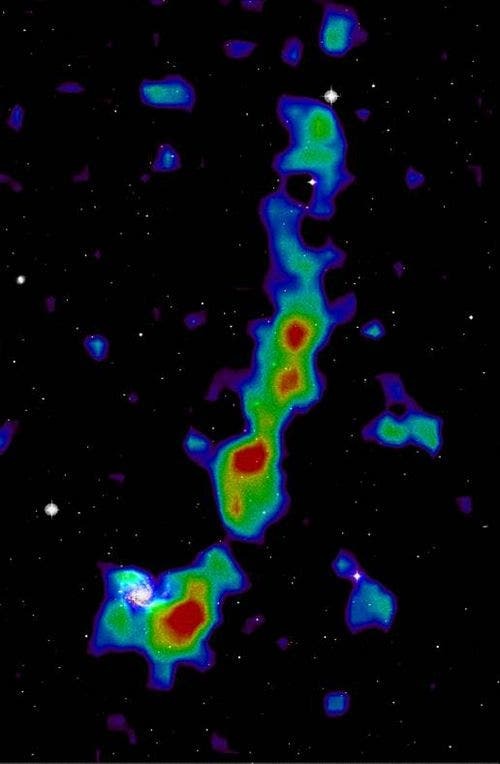 "That's exactly the kind of signature we look for if the Milky Way were being hit by these dark matter galaxies," he says.As promising as the mapping looks, Blitz is hedging his bets with a second approach: seeking gassy cores that could be embedded even in dark galaxies. "We're trying to survey regions of the sky to see if there are concentrations of atomic hydrogen that are not associated with known galaxies," he says. "I'm hoping that by making a large enough survey of the sky, we'll be able to find galaxies that contain only hydrogen and no stars. By looking at the motions of the hydrogen, we'll be able to determine the properties of the dark matter that's within it as well." The resulting map of interstellar hydrogen could help answer another paradox in astronomy: why today's galaxies haven't yet run out of gas. According to observations, most galaxies have just enough fuel left to make stars for another billion years or so. Yet galaxies have endured for most of the age of the universe, making it unlikely that so many should blink out at once. Blitz thinks they could be topping up their tanks with interstellar gases. As galaxies interact gravitationally, gases from their edges will get torn loose. These gases may eventually fall onto other galaxies, just as water vapor gets recycled back into rain. "There should be enough material between galaxies to be able to make up for the stars that are currently being formed," he says. "That's measurable with the Allen Telescope."